“Earthquake on the National Mall,” Histories of the National Mall, accessed April 22, 2019, http://mallhistory.org/items/show/189. On August 23, 2011, a 5.8 magnitude earthquake affected the Washington, DC area and much of the east coast. From its epicenter in Louisa County, Virginia, the unusual quake caused minimal damage. 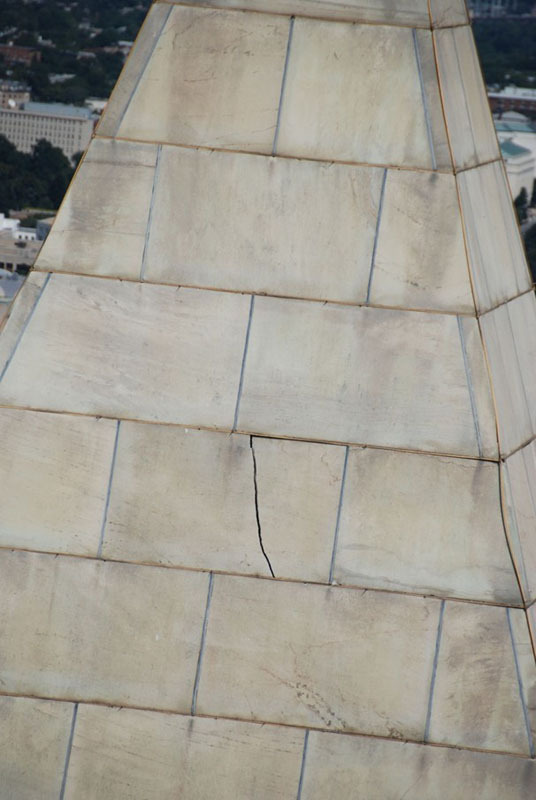 However, the exterior of the Washington Monument had several large cracks that required repair. The National Park Service closed the Monument for safety and the structure was clad in scaffolding until the repairs were completed in May 2014. National Park Service. View original.